Sure, it’s easy to pick on the big guy. And Mars Hill is a big guy. But what’s noteworthy here is the other sign. 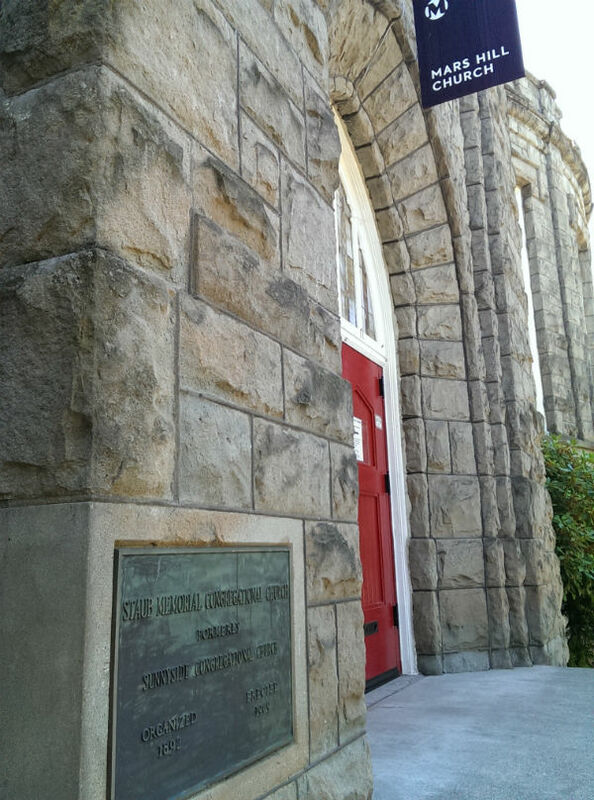 “Staub Congregational Church” sat on this corner for almost 100 years. Were they faithful? Were they fruitful? I don’t know. But I wonder how the essence of Staub Congregational is likened to the essence of Mars Hill. More noteworthy is this building’s proximity to where I am now serving: 5 blocks. We also have a big stone church on the corner in the neighborhood. What will become of us? Who knows? Interestingly, what Sunnyside has to offer as a United Methodist Church is more in keeping with what seems to be needed in Portland. We offer a full-bodied faith, inspired a robust understanding of grace: we know people need saved. We also know that people need discipline. We also know that God already loves us. We also know that we need each other. We look back at our heritage and see amazing fervor that would cause even Mars Hill to notice. We look back and see dedicated justice keepers. We look back and see small groups of people burdening themselves to help each other know Christ more fully. We envision a time when all of us will ‘feast together’ at the holy banquet of God. And yet the screamers and the hardliners seem to be winning the day. I wonder if what befell Staub Congregational Church was luke-warmness. This is not a frozen chosen joke, but a deep concern that our robust heritage fails due to lack of entertainment value. If that is the case (and I’m not convinced) then maybe we should be content with being small. But maybe people are so inundated with options that a jolt is required to wake them up. But then again, maybe an adequate invitation and a belief in what we offer is enough to seize the day. So, I’m not quite sure what to do here except, Observe, Observe, Observe. Staub Congregational grew and was re-named Community Bible Fellowship. They out grew the building and merged with another church and moved into their building. Now they are called Trinity Bible Fellowship. Also the stone from both Sunnyside and Mars Hill was cut from the same quarry in Eastern Oregon.